It was a delight to start the ALL NPLS 2018 conference in York on Saturday 1 December. My brief was to “enthuse” and “inspire” . Everyday. I am enthused and inspired by the power of primary teachers and the work they do around primary languages ,shared with me as founder of Primary Languages Network. I led the delegates through a series of steps to reflect upon the “super powers” of primary languages teaching and learning and how important it is in my opinion to harness these powers and to make sure the “primary” language learning voice is heard. Reaction from the delegates was really pleasing and I hope as you read and look at a brief resume of the speech that this blog post “enthuses “inspires” and “empowers” you too. Firstly we considered our super powers.What we do,what we bring to our work and how powerful this can be. run a specialist primary languages’ traded service, supporting mainly state and but also several private schools.You can find out more about the team here. lead and employ a team of 20 associate language teachers, working in 49 primary schools.The eys and ears of the network and the support system for all 314 schools. The VLE is the heart beat that allows us to reach all the classrooms and schools and support schools across a very broad spectrum and at their own point of need. We took time out to explore the brand new PLN 21st Century resource , Bitesize Mindfulness resource in French, Spanish and French and joined in with the French native speaker and focused on our breathing and explored a brand new planet of colours and feelings. We considered how this simple activity is becoming an integral part of primary schools’ ‘Wellness” packages and that the use of a foreign language is not a barrier to this being used as just a normal part of everyday primary life. A very powerful 21st Century resource indeed. Plus the primary languages’ power of this resource is also in the fact that teachers can use it over and again, can explore reading and listening skills, comprehension skills, preparation of texts and performance of own simple mindfulness activities , plus use this as a platform for creative writing in Literacy. What power! Next I asked the delegates to consider the power of being able to discuss and share with colleagues that you feel comfortable with and respect. I explained about the PLN associate team’s Whats APP group and how imoortant this .That we can share snippets here, that may have issues within them that we want to discuss.For example a clip that shows the memory skills and use of correct structures but may contain some inaccuracy in pronunciation even though taught by a native speaker and how it helps to discuss and share and become empowered and understand it can happen in any classroom and with the most able of pupils too and that it’s okay to fail, reflect and try again both as pupil and teacher. 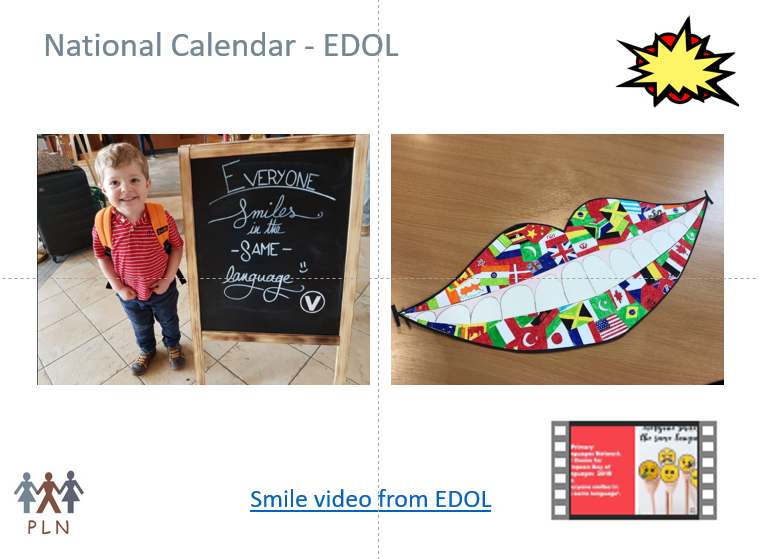 All the examples I shared are from the last couple of months and are a small part of the powerful evidence we are collecting to show the power of primary languages and how primary schools are empowered to “think out of the box” and be brave and be heard across the school and the wider school community. From powerful messages in French posters during “Anti-bullying Week” written down on posters to convey the right reactions, feelings and responses to prevent or stop bullying. To commemorating the lives and personalities of soldiers from WW1 in Remembrance people pillar poems. To “Wellness” days for both children and staff.Here are the staff from Merton Bank CP, joining in with Irene,our native speaker QTS teacher also a yoga teacher,during her Spanish and Super Day activities with the whole school. We took a moment to think about possible first or next steps towards engaging the whole school and creating simple activities with powerful messages that resonate positively across school.SLT and the wider community.For example Art displays and MFL or target language roleplay areas are engaging and can be supported by all staff. Plus in primary we really have wonderful opportunities to share all the special moments in young children’s lives.Thanks to a PLN conference speech by Therese Comfort in 2017 on the “tooth fairy~” and it’s importance in young children’s lives ,we created our own tooth fairy package. This packs a punch every time a child loses a tooth in class and goes home to mum or carer and is a reminder that in our classrooms we learn other languages too and share similar life moments with all children around the World.Pretty powerful I think! At the end of every academic year we hold a conference in North West England.This is a power packed day of great CPD, provided by both national and local speakers.In 2018 , Paul Philips, DHT, at a school in Ellesmere Port shared how his school had set up and held a two day Spanosh and interactive community event.All the children had worked on Art and performance linked to the Ready Made Spanish SOW in our VLE. From QR codes and press button speech bubbles to help feed the hungry giant (Year 3 Summer 1 focus) to an “outside in the grounds” performance of the PLN Year 4 Summer 1 “Walking in the Jungle” story with papier mache masks of jungle animals. The thing is that these are often isolated moments in the whole school year and the real power of primary languages teaching and learning needs to continue to be effective, creative and well planned week on week activities. The VLE is the heart beat of our networking community but it is also so important that there is rigour and clarity in all that we do.The VLE helps teachers plan,focus on progression, revisit, consider learning skills , develop these skills and stage by stage enable children to become more confident in how across the four skills of listening,speaking ,reading and writing they can understand. manipulate and produce sentences in the target language. Celebrations, fairy dust and magical creative moments add the sparkle but we need to see this sparkle in our lessons throughout the year.If we are to be taken seriously we need established and effective practice that we are happy to share at any time with SLT, governors, parents and dare I say it …OfSted. We took some moments to consider how we are tackling this challenge and empowering teachers in the primary language learning classroom. You can find out more here on our Primary Languages Network website and maybe reflect on your own practice and the ways you already feel empowered or wish to become more “empowered” in your practice. We are now offering Pedagogy CPD to network and non- network members too. “Self efficacy” of both learners and teachers is in my opinion key to the power of continued,respected and sustainable primary languages and the key to keeping the essence of the learning “primary”. I can’t achieve this on my own . There is the “PLN team” behind me.I shared photos of Catherine, the Network Coordinator, first point of contact for all 314 schools and also Primary Languages Development Award mentor, and also some of the associates’ team who are now becoming CPD providers. Over the course of a term Emilie and Will also observe all the assoiate teachers and confer on what they see and how this need sto be shared with network schools.Powerful and positive1 The team are now the future power,momentum and sustainability of the success we achieve alongside the supportive network of schools. There is so much knowledge and experience amongst everyone mentioned that it needs to shared and heard.It’s a powerful voice .We have now set up a podcast programme to begin to share this voice and the voice of other powerful practitioners and experts too. I was the first guinea pig! You can subscribe here. The system we have developed is powerful and reaches in deep in to schools. From 1 to 1 coordinator webinars, creative webinars and face to face CPD, local network meetings and events plus virtual VLE tours but there would be no positive power if schools did not engage. I mentioned earlier that we are a traded service and just like teachers in the real classroom we are held to account at the end of every academic year or during and after inspections and governor reviews. We gather evidence and share and celebrate this. Here is my most recent compiation blog post of evidence of progresss in Autumn 2018. So ,finally take a look at this case study of a school in St Helens where the whole school has embraced the power of primary languages and to their absolute credit is developing language learning fit for the 21st Century. Queens Park CE/URC Case Study and Blogpost. My message at the end of the presentation has to be “Please do not dismiss primary language learning but take away from what you have read here or seen in your school that there is so much power in primary languages when it is implemented well.It is and shlouod be an integral part of learning for young children and can have a powerful and positive impact across the curriculum. Primary language learningshould provide a clear and supported pathway to learning languages in secondary school and beyond.